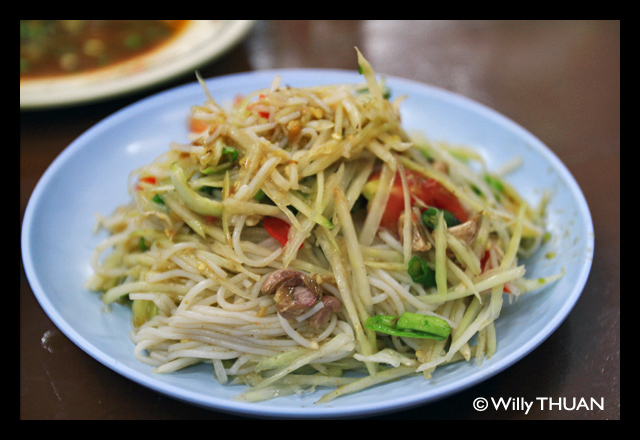 am Sua is a tough variation of the well known Som Tam even though the word Tam Sua practically means ‘salad anything’. The dish looks pretty much like the photo above every time I order it. So what’s inside? Here’s my version of Tam Sua. You’ll find that it’s really similar to a Som Tam… for the brave! Any vegetables that you like, such as cabbage or bean sprouts. In this sample we have thinly sliced eggplants. Crispy pork skin also goes well with the dish. Don’t forget the right mortar. 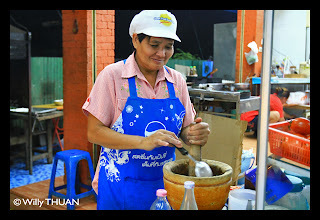 You’ll need a mortar for all Som Tam dishes, otherwise it feels less authentic. 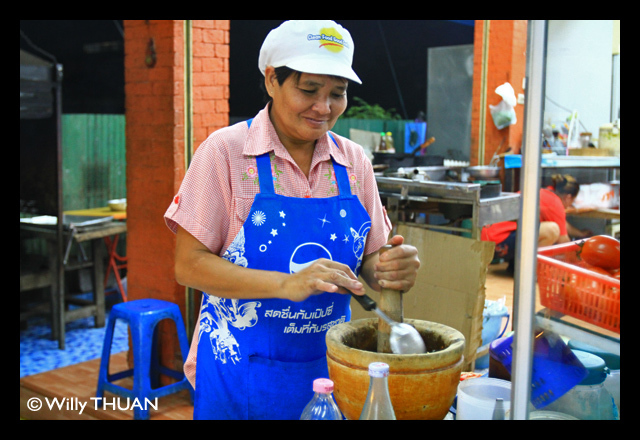 We don’t use a stone mortar to make Som Tam though, because stone is too heavy. It smashes the ingredients rather than crushing and mixing them nicely. Use a clay Laos Style mortar and pestle. Put garlic and chili in the mortar. Crush them slightly then put in Nam Pla (fish sauce), Pla Ra (fermented fish) and Lime Juice. Don’t throw away the lime skin, throw it in the mortar (I’m serious). How much you put each of the ingredient in is up to your taste. Mix in the papaya and Poo Kem (crab). Crush them a little – be gentle with the papaya. You may put Poo Kem in first if you’d like. Once again, don’t over crush it. Add rice noodle. Mix the salad together. If you choose to have the crispy pork skin, add them the last or put it on top. Voila! If all this is too complicated – you’ll be happy to know that you can always order this dish from any local places that has the usual Som Tam, be it E-Sarn restaurants or Som Tam pushcarts. The upmarket restaurants that feature classic Som Tam in their menu won’t have it though, because this is really too local. I tried but it’s really too ethnic (to be polite). It smells like fermented fish (to be polite) and tastes like fermented fish (to be polite).